The unveiling of San Francisco’s next police chief, veteran Los Angeles Police Department Deputy Chief William Scott, was a occasion of celebration at City Hall on Tuesday. 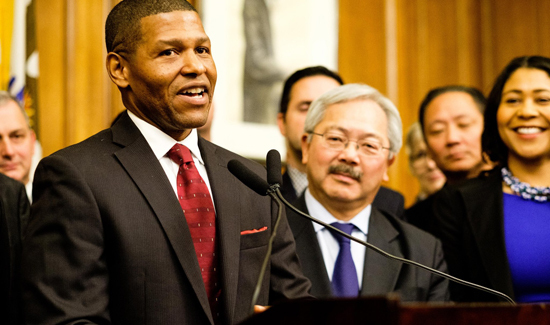 A beaming Mayor Ed Lee announced to reporters who will lead the troubled department, and flanking the mayor were The City’s law enforcement leaders, from the department’s command staff to the district attorney and sheriff. The fire chief even showed up. But the major absence in the room was the leader of the Police Officers Association. Martin Halloran, the union’s president, offered a tepid statement about the selection of Scott that noted the union’s top choice for the role, Acting Chief Toney Chaplin, wasn’t picked — as had been the case when the mayor named union-favorite Greg Suhr police chief in 2011. Chaplin was appointed acting chief in May after Suhr resigned. The union, however, sent an entirely different message just hours later to its roughly 2,300 members. That message, while offering a fig leaf to the new chief, did not mince words when it came to Lee’s choice of an outsider. Halloran said the mayor should have included the union in the selection process. “But he picked the new chief in secret, behind closed doors, and by so doing he turned his back on the rank and file,” Halloran wrote. In an email to the San Francisco Examiner, mayoral spokesperson Deirdre Hussey responded to Halloran’s claims. It remains to be seen how Scott will deal with the POA, which has stuck to its guns in the past several years over longtime policing practices despite a national movement toward reform. At least one recent review of the department went so far as to lay much of the department’s dysfunction on a culture promoted by the union.